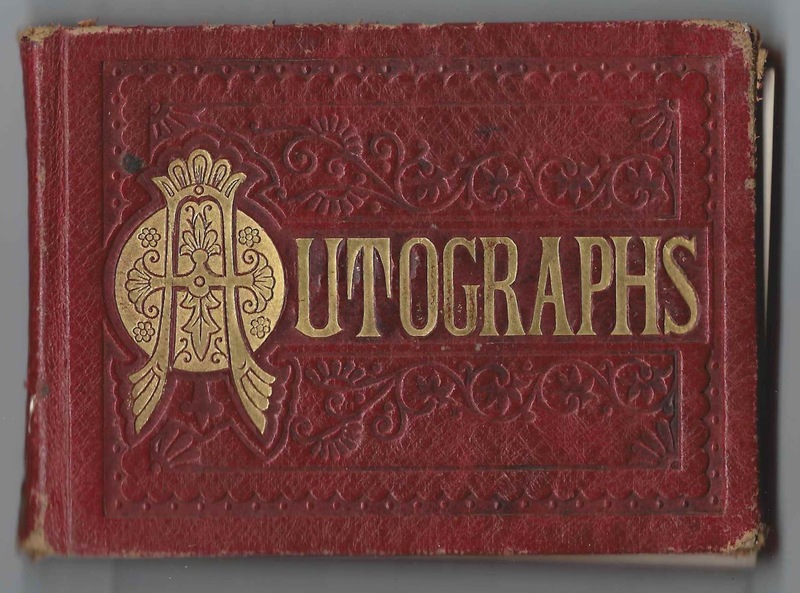 1870s autograph album that belonged to a Clara, with most of the autographs from Elizabethtown, New York. 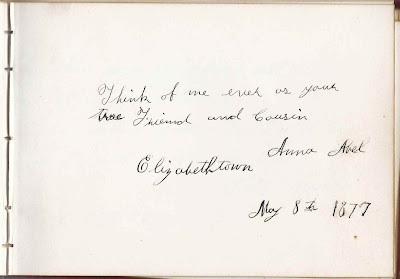 Two signers indicated a cousin relationship with Clara, which helped me determine that she was Clara Williams of Elizabethtown. 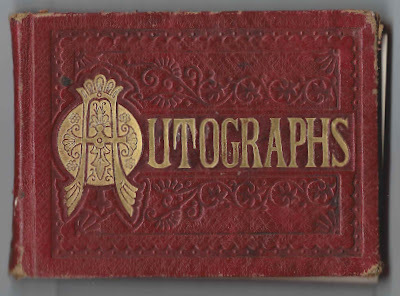 The album is approximately 5-1/4" x 3-3/4" and is thicker than one would assume from those dimensions. The fore edges are washed in gold. The album contains the sentiments of 20 of Clara's relatives, friends and schoolmates. 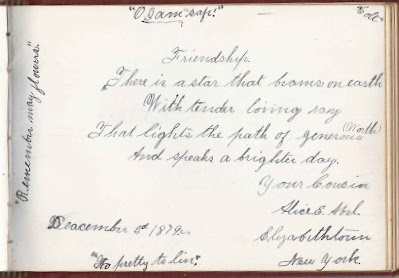 Clara Williams was born 2 September 1864, in New York, the daughter of Charles N. and Mary Almira (Abel) Williams. Mary was the daughter of Oliver Abel and his second wife Almira (Barnum) Abel. I don't have the name of the parents of Charles N. Williams. 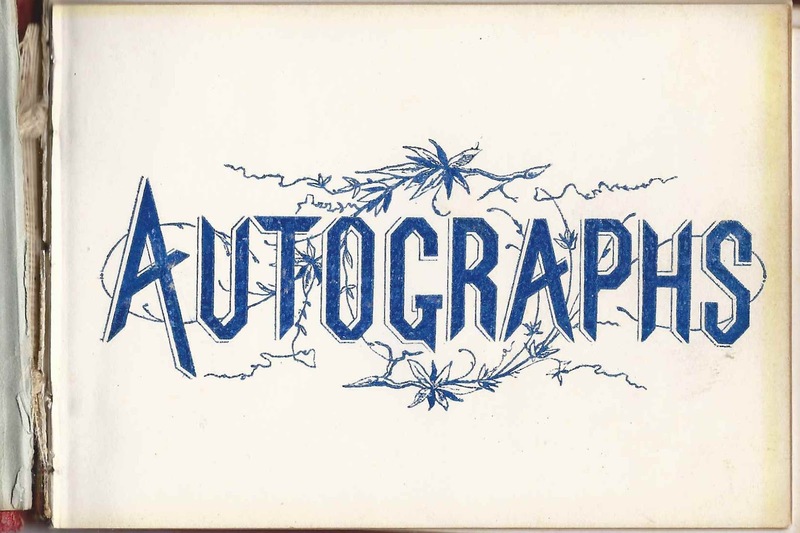 The first autograph in the album was that of Anna Abel, signed at Elizabethtown, New York, on May 8, 1877. 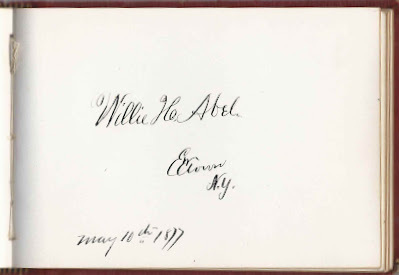 I believe it was her brother Willie Abel who signed another page at Elizabethtown, New York, on May 10, 1877. Anna Bartlett Abel and William Henry Abel were the children of Oliver and Mary Elizabeth (Adams) Abel. Oliver was the older half brother of Clara's mother Mary Almira (Abel) Williams. 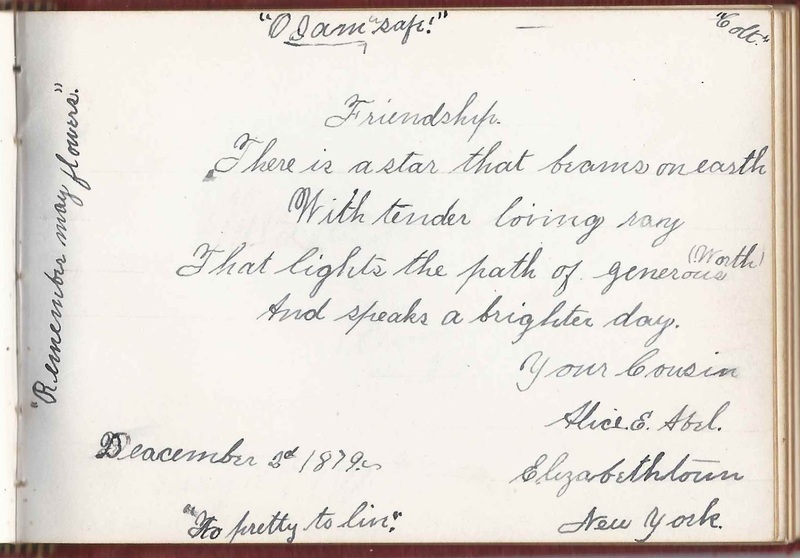 Another cousin, Alice E. Abel, signed a page at Elizabethtown, New York, on December 2, 1879. She was Alice Eunice Abel, daughter of Leander and Emily Farrar (Williams) Abel. Leander was another older half-brother of Clara's mother Mary Almira (Abel) Williams. 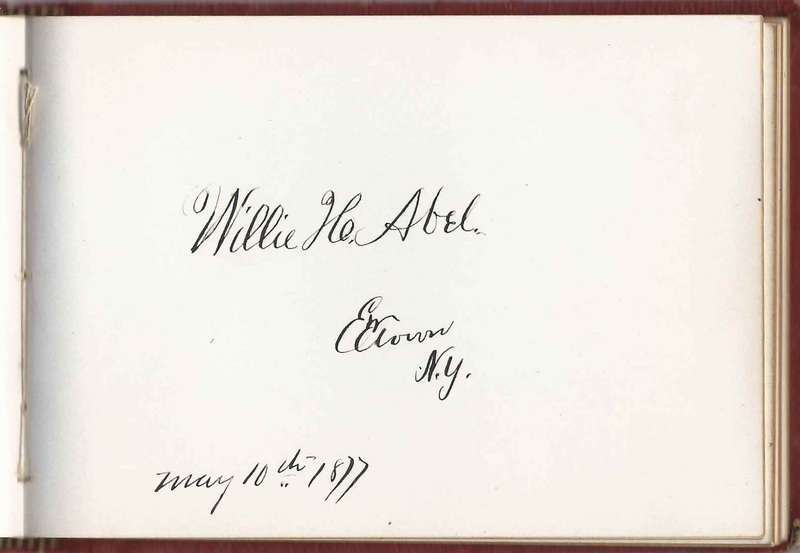 Interestingly, Emily Farrar (Williams) Abel had a brother named Charles Noble Williams. 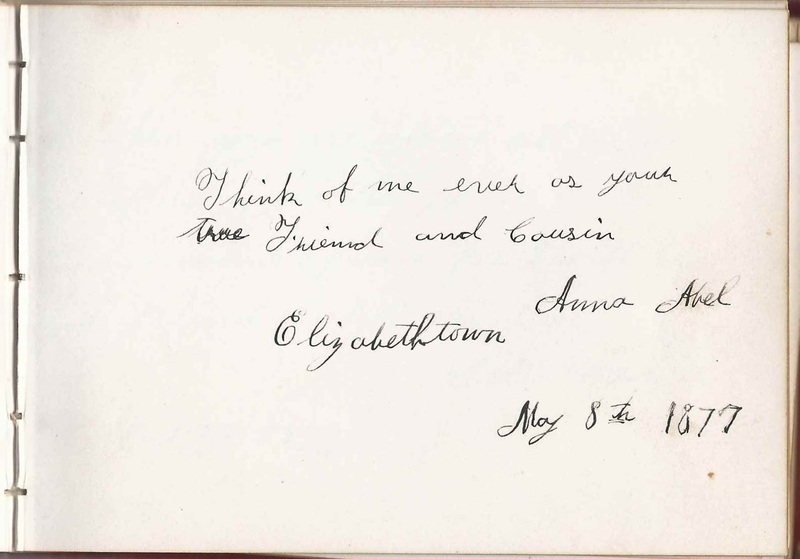 It's tempting to think that they were the same person, but online trees for him has his father as Samuel W. Williams, and his mother George Stevens, whereas a death notice for a Eunice Stevens who died at the home of Charles N. Williams at Elizabethtown, New York, indicated that her husband was George Stevens. Perhaps the newspaper accidentally attributed Eunice's maiden name to her husband George. And perhaps they also got the first name wrong, as George rather than Samuel. Perhaps a reader will leave a comment that solves the mystery. If Charles N. Williams was in fact Charles Noble Williams, that means that the Clara Williams and Alice Eunice Abel were related on both sides. Clara died 19 May 1927, I believe unmarried.
? L. McDougal, signed on April 16, 1878. There was a Mina McDougal at Elizabethtown, New York, and the first name could be Mina but it looks as though there's at least one more letter, if not two.